Soybean is primarily an oilseed containing about 20% oil. The extraction of oil results in a high-protein cake that can be further processed into a variety of products for feed and food uses. One of these products, soybean meal, is one of the major feed commodities and is the main protein source in many animal diets. Whole soybeans after extracting oil are usually called "full-fat", the latter being usually heat processed in order to destroy the antinutritional factors and improve their feed value. These products can be ground, pelleted, flaked or powdered. 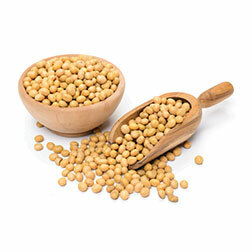 Highly popular products from soybean are soy-flour, soy-milk, and tofu-like products. It may be roasted and eaten as a snack, or fermented to make tempeh, miso and soy sauce. Immature soya beans are also eaten as a vegetable, as well as bean sprouts. Moisture 10 to 12 pct. Foreign Matter 2 pct to 4 pct max. Green seed 10 to 13 pct max. Small seed 10 to 15 pct max.